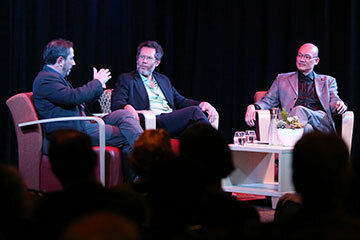 The UC Santa Cruz Institute for Humanities Research launched its first public event, “Questions That Matter: Making the Cosmos Local,” on Jan. 27. About 200 attendees listened to a dialogue between UCSC physics professor Anthony Aguirre and associate history professor Minghui Hu at the Kuumbwa Jazz Center in downtown Santa Cruz. The dialogue, based on questions asked by history professor Nathaniel Deutsch, aimed to establish, realize and question the connection between humanity and the universe. The launch also addressed the core subjects of humanities, history, ethics, language and religion while also celebrating UCSC’s 50th anniversary. The conversation compared science to culture and civilization — the science of the cosmos as it relates to historical cultural society, specifically Eastern Chinese history. While Aguirre provided insight into the scientific understanding of the cosmos, Hu explained the universe in relation to Chinese history and the cultural understanding of China’s relationship to the cosmos. Once the conversation between the professors ended, the event shifted to a Q&A format for audience members to pose questions. While the audience was predominantly composed of Santa Cruz community members, a handful of UCSC undergraduate and graduate students also attended. “Questions That Matter” is a series that informs and challenges audience members to understand the “bigger picture” in relation to not just the community, but the entire world and universe, physics professor Aguirre said.